At The Awning Man, we stock Half Cassette Awnings that can be manually operated by using a winder handle or electrically controlled by switch, remote control or weather sensor. The Half Cassette Awnings are available in a variety of colours, both solid plain and striped, and are made from high quality, waterproof 300gsm (grams per square metre) polyester. 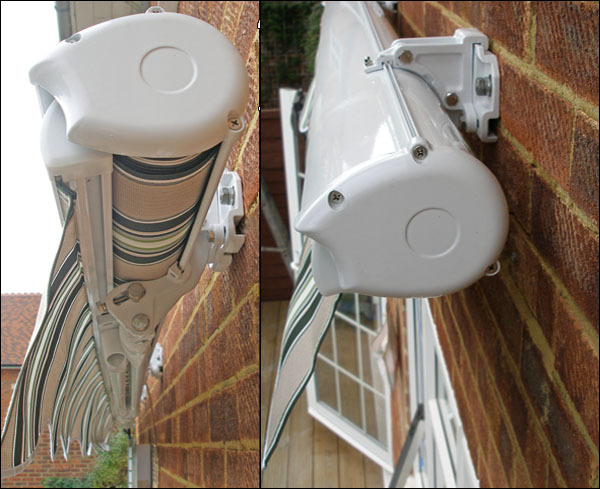 The awnings come complete with all neccessary expansion bolts and wall brackets. If you've ordered a manual half cassette awning, the awning will be provided with a winder handle to manually operate it. For the electric awnings, you may choose on the awning product page which electric control you would like to purchase to operate the awning, though you will also be suppleied with a winder handle to manually operate the awning. The half cassette awning can be opened as much or as little as you like up to the maximum projection and you can alter the slope of the awning from almost horizontal to a relatively steep tilt of approximately 35 degrees from the horizontal. 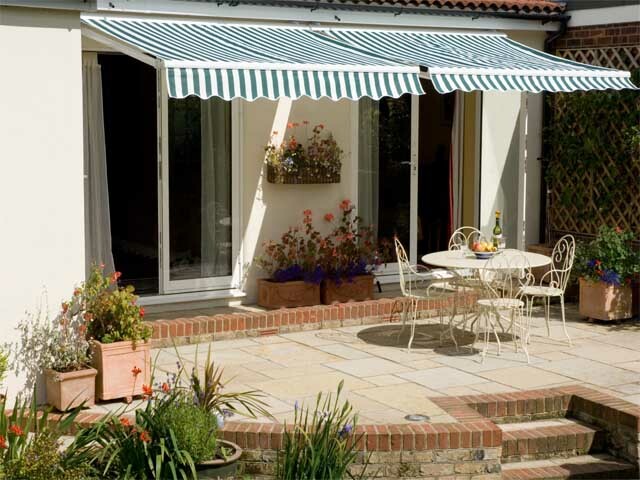 All our awnings are delivered FREE within the UK. Please choose either Manual or Electric below to filter the results to manual awnings and electric awnings. Electronically operated Blue Stripe Half Cassette Awning Width 1.5 metres with a projection o..
Manually operated Blue Stripe Half Cassette Awning Width 1.5 metres with a projection of 1 metre ..
Electronically operated Blue Stripe Half Cassette Awning Width 3 metres with a projection of ..
Manually operated Blue Stripe Half Cassette Awning Width 3 metres with a projection of 2.5 me..
Electronically operated Blue and White Stripe Half Cassette Awning Width 1.5 metres with a pr..
Manually operated Blue and White Stripe Half Cassette Awning Width 1.5 metres with a projecti..
Electronically operated Blue and White Stripe Half Cassette Awning Width 2.5 metres with a pr..
Manually operated Blue and White Stripe Half Cassette Awning Width 2.5 metres with a projecti..
Electronically operated Blue and White Stripe Half Cassette Awning Width 2 metres with a proj..
Manually operated Blue and White Stripe Half Cassette Awning Width 2 metres with a projection..
Electronically operated Blue and White Stripe Half Cassette Awning Width 3.5 metres with a pr..
Manually operated Blue and White Stripe Half Cassette Awning Width 3.5 metres with a projecti..
Electronically operated Blue and White Stripe Half Cassette Awning Width 3 metres with a proj..
Manually operated Blue and White Stripe Half Cassette Awning Width 3 metres with a projection..
Electronically operated Blue and White Stripe Half Cassette Awning Width 4.5 metres with a pr..